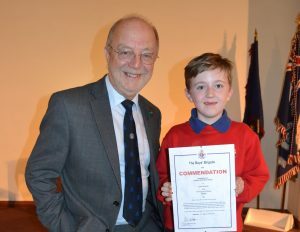 Dylan Gilmartin of the 11th Kingston & Merton Boys' Brigade Company was presented with the President's Commendation Award by John Smith, KMMS Battalion President for the actions he took when his Dad collapsed at home. Showing a maturity beyond his years, Dylan kept calm and called the emergency services then comforted his Dad until the emergency services arrived. His Dad has now recovered.